We're Moving our Top News Over to our Very Active Blog! We are effectively retiring this area of our website, as past experience has shown that our very-active Blog is the best place to get SCADAmetrics news out fast! We're still going to leave the older stories up here on this page, but going forward, please be sure to visit the Blog by CLICKING HERE, and please add it to your bookmarks! Thank you! 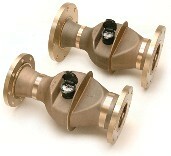 EtherMeter Compatible With Magnetic Flow Meters Manufactured by McCrometer. SCADAmetrics is pleased to announce that its EtherMeter is verified compatible with the new, AMR-enabled magmeters manufactured by McCrometer. McCrometer's new UI-1203 AMR communication module is available for its diverse line of flanged-type and insertion-type magnetic flow meters. The module can be pre-installed by the factory, or field-installed as a retrofit kit . The module features the ability to communicate NET total consumption readings via an absolute-encoder AMR protocol – a capability that makes it compatible with both the EtherMeter and most AMR systems. As a consequence of EtherMeter compatibility, the UltraMag®, FPI Mag, and SPI Mag Meters can now be read using a wide range of industrial protocols and interfaces, including MODBUS (TCP, UDP, RTU, and ASCII), and Allen Bradley’s DF1 and EtherNet/IP™. The EtherMeter’s Compatibility Matrix has been updated to reflect the addition of this new meter. All testing was performed using a meter provided courtesy of McCrometer (Hemet, CA). To learn more about McCrometer Magnetic Flow Meters, please give us a call or visit McCrometer's website. Interested in Accumulating Flow Totals from a 4-20mA Flow Meter? When totalizing the total accumulated flow through a non-absolute-encoder flow meter, it is generally preferable to interface with a pulse-per-volume signal (eg. 1 pulse per gallon). 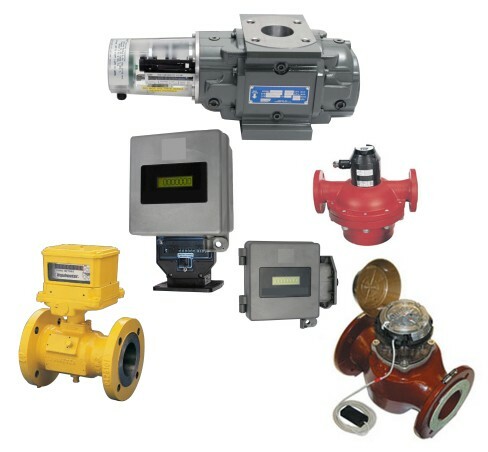 However, certain flow meters only offer a 4-20mA signal that is proportional to rate-of-flow. Examples include certain WH Power Meters, Parshall Flume-Type Wastewater Flow Meters, Differential-Pressure Flow Meters, and many others. While it is certainly possible to program a computer or PLC to perform a running time integral of the rate-of-flow signal, this technique is difficult, time-consuming, and fraught with pitfalls. A straightforward and elegant hardware-based solution is to convert the 4-20mA signal to a pulse, and utilize the EtherMeter’s sophisticated pulse-processing capabilities to provide both totalization and rate-of-flow. The FlowCom register is available pre-installed or as a retrofit kit, and it is attached to McCrometer's diverse line of propeller-based flow meters. 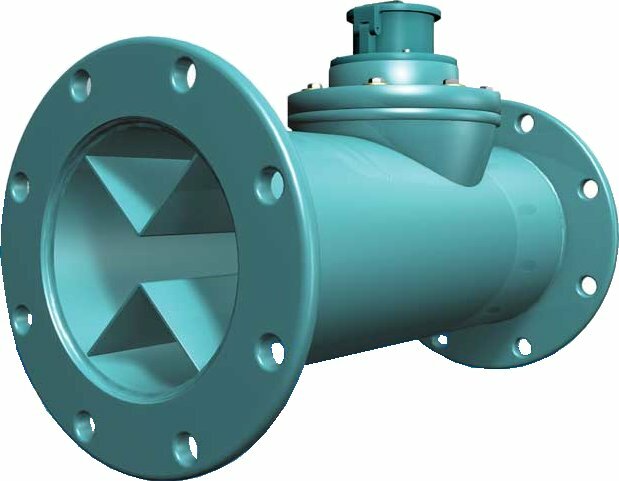 Propeller-type flow meters are popular in well-based potable water and farm irrigation systems due to their ability to function reliably in the presence of suspended solids. The new FlowCom register features the ability to communicate total consumption readings via an absolute-encoder AMR protocol – a capability that makes it compatible with both the EtherMeter and most AMR systems. As a consequence of EtherMeter compatibility, the McPropeller and Water Specialties Propeller Meters can now be read using a wide range of industrial protocols and interfaces, including MODBUS (TCP, UDP, RTU, and ASCII), and Allen Bradley’s DF1 and EtherNet/IP™. The EtherMeter’s Compatibility Matrix has been updated to reflect the addition of this new meter. All testing was performed using a meter provided courtesy of McCrometer (Hemet, CA). To learn more about McCrometer Propeller Meters and the Flowcom register, please visit McCrometer's website or contact your local McCrometer representative. New EtherMeter Model Unveiled - Transmits Flow Metering Data Over The Iridium Satellite Data Network. SCADAmetrics is pleased to announce the introduction of an EtherMeter that has been tailored to transmit its metering data through the Iridium Satellite Data Network. SCADAmetrics is pleased to announce that its products are also now available for purchase on a new Mobile-Version eStore. Just browse to shop.scadametrics.com, and our server will autodetect your mobile device and render an interface that has been optimized for mobile interaction. Manufactured By Neptune Technology Group. SCADAmetrics is pleased to announce that its EtherMeter SCADA/Meter Gateway is verified compatible with the TRU/MAG magnetic flow meter manufactured by Neptune Technology Group. 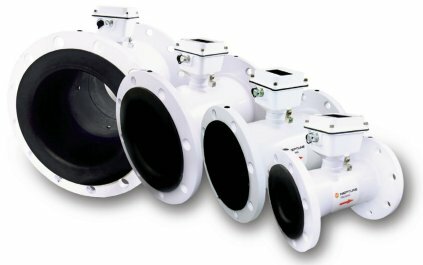 The TRU/MAG, a battery-powered, flanged magnetic flow meter by Neptune, was introduced to solve a wide range of industrial and commercial custody transfer flow measurement applications. In a divergence from most available magmeters, the TRU/MAG features the ability to communicate total consumption readings via the Neptune AMR protocol – a capability that makes it compatible with both the EtherMeter and most AMR systems. As a consequence of EtherMeter compatibility, the TRU/MAG can now be read using a wide range of industrial protocols and interfaces, including MODBUS (TCP, UDP, RTU, and ASCII), and Allen Bradley’s DF1 and EtherNet/IP™. The EtherMeter’s Compatibility Matrix has been updated to reflect the addition of this new meter. 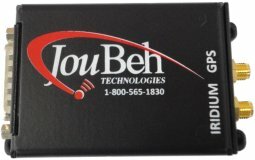 All testing was performed using a meter provided courtesy of Ti-Sales (Sudbury, MA). To learn more about the TRU/MAG, please visit Neptune's website or contact your local Neptune distributor. SCADAmetrics Awarded US Patent Number 8,219,214. On 10 July 2012, SCADAmetrics was awarded US Patent Number 8,219,214, entitled: Supervisory Control and Data Acquisition Protocol Converter. Link to Patent on US Patent & Trademark Office Website. The patent represents years of research and product development for the EtherMeter, an electronic flow-metering and protocol conversion instrument manufactured by SCADAmetrics. With the increasing popularity of applications in which EtherMeters are connected to SCADA systems via cellular gateways, a great deal of attention is being paid to network bandwidth minimization strategies. In the past, water districts have successfully leveraged the EtherMeter's MODBUS/UDP protocol capability (implemented as MODBUS/TCP over UDP) to greatly reduce the amount of data traffic (measured in kilobytes-per-month). Examples of MODBUS Masters that support MODBUS/UDP are the KepServerEx OPC Server by Kepware Technologies and the Digi One IAP Protocol Gateway by Digi Corporation. MODBUS/UDP is featured in the base firmware version of the EtherMeter. Recently, in support of a customer's unique cellular-based master metering project, SCADAmetrics provided a protocol implementation of MODBUS/RTU over UDP. In this application, the new protocol provides optimized cellular gateway compatibility for Indusoft SCADA Software and other similar MODBUS Masters that support MODBUS/RTU over UDP. This firmware version is available for new EtherMeter orders at the SCADAmetrics eStore, and provides a no-additional-cost replacement for MODBUS/UDP. 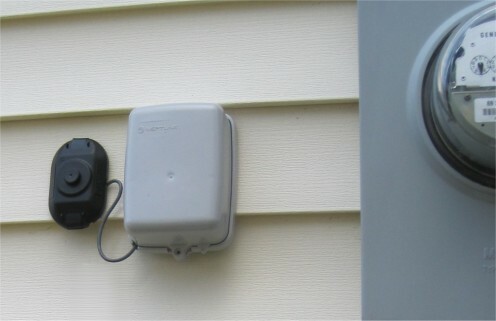 At many water meters, it is desirable to connect the meter to both a meter display unit AND an AMR radio endpoint. A popular meter display unit is the VisuLink VL9 by Kemp-Meek Manufacturing; and example AMR radio endpoints include the Neptune R900, Sensus MXU, Itron ERT, and many others. 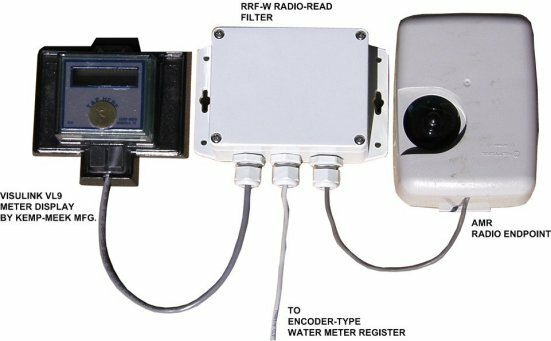 Today, SCADAmetrics makes dual water meter-reading possible with the introduction of the RRF-W “Radio-Read Filter, Wall Mount Version”. 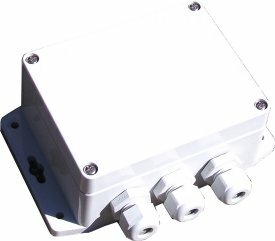 The RRF-W is housed within a weatherproof NEMA-4X wall-mountable enclosure; and because it derives all necessary power from the connected meter readers, the RRF-W does not require batteries or an external power supply. SCADAmetrics is pleased to announce that its EtherMeter SCADA/Meter Gateway is verified compatible with the FM MAG 8000 magnetic flow meter manufactured by Siemens Industry. 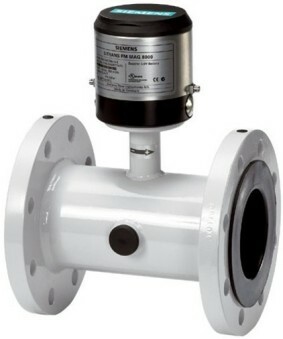 FM MAG 8000 Magnetic Flow Meter. 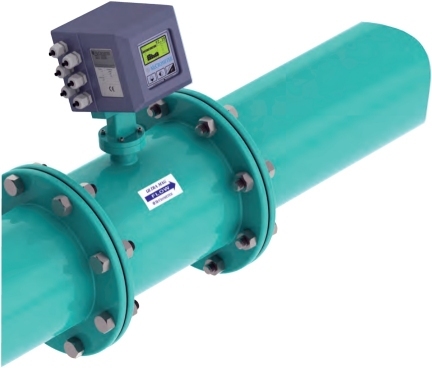 The FM MAG 8000, a battery-powered, flanged magnetic flow meter by Siemens, was introduced to solve a wide range of industrial and commercial custody transfer flow measurement applications. In a divergence from most available magmeters, the FM MAG 8000 features the ability to communicate total consumption readings via the popular “Sensus” AMR protocol – a capability that makes it compatible with both the EtherMeter and most AMR systems. As a consequence of EtherMeter compatibility, the FM MAG 8000 can now be read using a wide range of industrial protocols and interfaces, including MODBUS/TCP, MODBUS/RTU/ASCII, and Allen Bradley’s DF1 and EtherNet/IP™. The EtherMeter’s Compatibility Matrix has been updated to reflect the addition of this new meter. All testing was performed using a meter provided courtesy of Siemens Industry (Spring House, PA). To learn more about the FM MAG 8000, please visit Siemens' website or contact Brian Roughan at (631)231-3600. By Master Meter Inc. (Mansfield, TX). 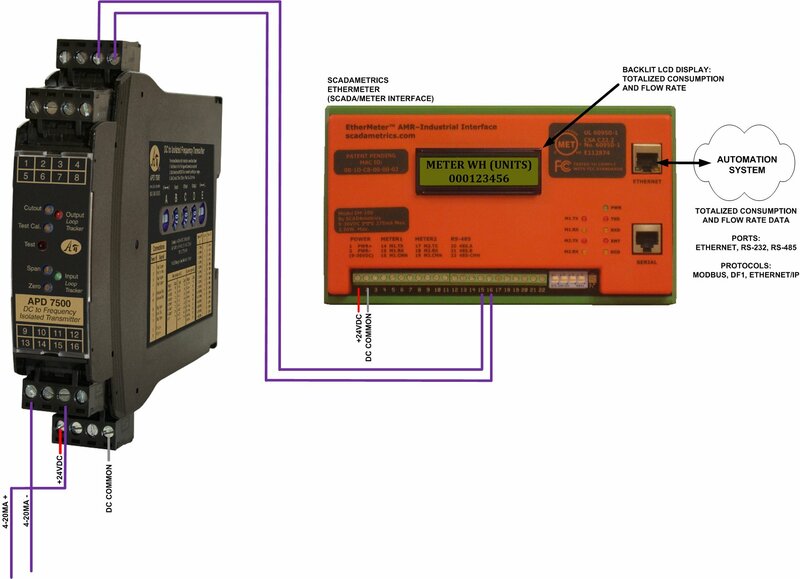 SCADAmetrics is pleased to announce that its EtherMeter SCADA/Meter Gateway is compatible with water meters manufactured by Master Meter, Inc. (Mansfield, TX). Meters By Master Meter, Inc. 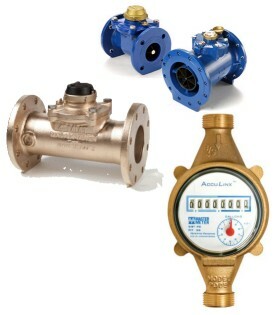 Recently, Master Meter introduced the AccuLinx™, a new encoder-type water meter register. The AccuLinx provides 8-wheel remote readings, thereby allowing for the collection of fine-resolution totalization and realtime flow-rate data. 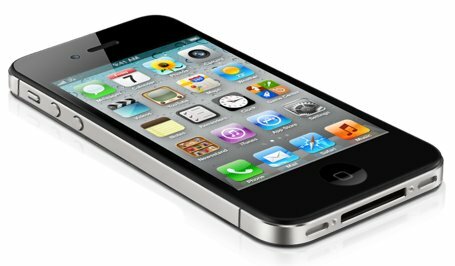 It does not require a battery and communicates via the popular "Sensus" AMR protocol. As a consequence, all of their meters that are manufactured or retrofitted with the AccuLinx register and coupled with a SCADAmetrics EtherMeter can now be read using the MODBUS and Allen Bradley communication protocols. The Meter Compatibility Matrix has been updated to reflect the addition of this new family of meters. All testing was performed courtesy of MSgt. Dennis Marsalek at Davis-Monthan AFB (Tucson, AZ). 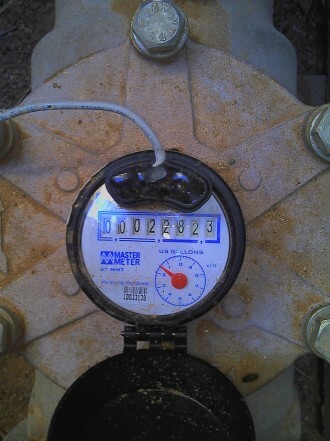 6 Inch MMT Turbo Meter, Installed At One Of Davis-Monthan AFB's Well Stations. EtherMeter Connected to The 6 Inch MMT Turbo Meter. Communications To The Base Energy Management System Is Via MODBUS/TCP. Note The Perfect Agreement Between The AccuLinx Register, the EtherMeter, and as a consequence — the Energy Management System. Touch-Read Filter (Wall Pad Version) Unveiled. Touch-Read Pad And An AMI Radio Endpoint. SCADAmetrics is pleased to announce the addition of the TRF-W to its line of meter-reading accessories. The TRF-W enables a water meter to be readable by both an AMI Radio Endpoint AND an Inductive Touch-Read Pad. Example AMI Radio Endpoints include the Neptune R900, the Itron ERT, the Sensus MXU, and many others. Both An AMI Radio Endpoint and a Touch-Read Pad. Having both Radio-Read and Touch-Read redundancy can be an invaluable benefit for utilities with indoor meter sets. Additionally, a hybrid combination of Radio-Read and Touch-Read is often convenient for custody transfer meters when one utility has radio-read equipment, and the other is equipped with touch-readers. When a Touch-Read Pad has been enhanced with the SCADAmetrics Touch-Read Filter, this redundancy is easily achieved. The TRF-W, which enables this parallel connection, is inexpensive, compact, simple to install, and compatible with most wall-mounted Touch-Read Pads and encoder-based water meters. The unit features gold-plated contacts and a silicone weather-resistant coating for reliable operation within even the harshest outdoor environments. A Touch-Read Pad Enhanced With the TRF-W 'Touch-Read Filter'. Pulse-Based Meter Support Added To EtherMeter. Boosts Compatibility With Industrial Gas, Petroleum, & Chemical Meters. SCADAmetrics is pleased to announce the addition of pulse-type meter support to the EtherMeter. Pulse processing technology allows the EtherMeter to collect meter totalization and flow rate data from non-encoder-based meters. Common examples include petroleum & chemical meters, commercial & industrial natural gas meters, volume correctors, and many others. When the EtherMeter handles pulse-based meters, the totalization and flow-rate data is stored and transmitted from the same Modbus- and Rockwell-compatible memory registers that it uses for encoder-based meters. 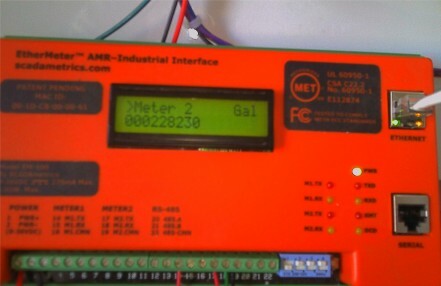 Therefore, regardless of which type of meter(s) is connected to the EtherMeter (encoder versus pulse), collection of totalization and flow data by the connected SCADA system is identical. Into MODBUS And Rockwell Automation Industrial Protocols. Effective immediately, all future EtherMeter shipments shall feature pulse-based meter support as standard. The User Manual and Application Notes have been updated to reflect the addition of this new feature. Boosts Elster-AMCO, ABB, and Kent Meter Compatibility. SCADAmetrics is pleased to announce the addition of K-Frame protocol support to the EtherMeter. K-Frame is the native AMR protocol for the electro-mechanical and magnetic meters that are manufactured by Elster-AMCO, ABB, and Kent. The EtherMeter now features combined support for the Sensus, Neptune, and K-Frame AMR protocols, which together comprise the vast majority of absolute encoder protocols in use today. 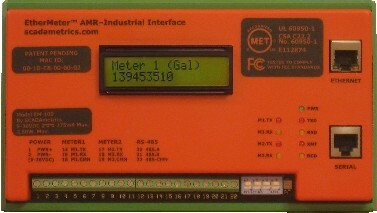 To simplify its application, the EtherMeter automatically determines the required AMR protocol for any connected meters. Additional compatible meters now include the T(C/F)-4000 and T(C/F)-3000 Turbines (Elster-AMCO/ABB/Kent), the S-2000 Single-Jets, the C700 Positive Displacements (Elster-AMCO/ABB/Kent), the AquaMaster mag-meters (ABB), the evoQ4 mag-meters (Elster-AMCO), and others. K-Frame Protocol Meters From Elster-AMCO, Kent, and ABB. Effective immediately, all future EtherMeter shipments shall feature K-Frame support as standard. The User Manual, Compatibility Matrix, and Application Notes have been updated to reflect the addition of this new feature. Dual SCADA System Access To Master Meters Now Possible. In many custody-transfer master metering stations, it is desirable that the water meter totalization and flow-rate data be continuously read by two independent SCADA systems: By both the Buyer AND the Seller. Today, SCADAmetrics is pleased to unveil an exciting new SCADA/Meter accessory that enables two SCADA systems to share access to a single master meter: the RRF-50 "Radio-Read Filter". The RRF-50, which is contained within a standard 35mm Din-Rail mountable package, effectively allows two EtherMeter-equipped SCADA systems to independently interrogate a single master meter using Modbus, DF1, and EtherNet/IP protocols. 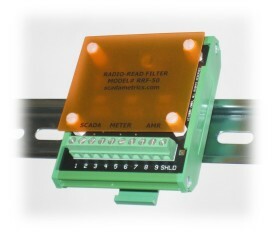 Because the RRF-50 derives all necessary power from a connected EtherMeter, no external power supply is required. Additionally, the RRF-50 can be used to provide both a SCADA system and an AMR (Automatic Meter Reading) system with concurrent access to a single meter, as well. Example AMR interfaces include the Sensus MXU, Neptune R900, Itron ERT, and many others. Now Possible With The EtherMeter. SCADAmetrics is pleased to announce that several hot water meters have been determined to be compatible with the EtherMeter. This list will be updated as additional compatible hot water meters are located. For commercial sub-metering and plant process monitoring applications, this means that precise totalization and flow rate information may now be collected from hot water meters using the Modbus, DF1, and EtherNet/IP protocols. Sizes 3/4" thru 6" (link). 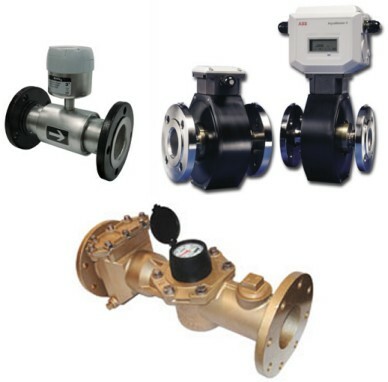 Maximum Water Temperature: 180 degrees F.
MVR Hot Water Meter By Mueller Systems / Hersey. Maximum Water Temperature: 194 degrees F.
Enduro and Spectrum Hot Water Meters By Metron-Farnier. Allen Bradley (Rockwell Automation) Product Families Announced. The EtherMeter™ SCADA/Water Meter Gateway has further broadened its industry compatibility by passing in-house communication tests with the following Allen Bradley PLC product lines: ControlLogix, CompactLogix, SLC/5xx, MicroLogix, and NET-ENI. Both EtherNet and Serial (RS-232 and RS-485) communication methods are supported across Allen Bradley’s modern control equipment lines. Serial support includes the DF1 Full Duplex and DF1 Radio Modem protocols, and Ethernet support consists of the EtherNet/IP™ protocol. Registers (Via An EtherMeter) Using EtherNet/IP. 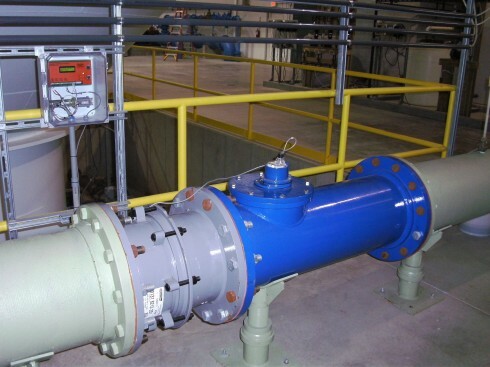 Broadened compatibility means that Allen Bradley-based SCADA and Telemetry systems may now utilize the EtherMeter to collect exact totalization and flow rate data from large turbine meters within water treatment and distribution systems. Typical application sites would include pumping stations, treatment plants, and master meter stations. Effective immediately, all future EtherMeter shipments shall feature MODBUS, DF1, and EtherNet/IP protocol support as standard. EtherMeter™ Granted Safety Recognition By MET Laboratories. SCADAmetrics is pleased to announce that MET Laboratories (Baltimore, MD) has granted the EtherMeter safety recognition in the United States for UL standard 60950-1 (Safety of IT Equipment) and for the equivalent Canadian standard, CSA C22.2 No. 60950-1. In addition to safety certification, the EtherMeter was tested for radiated emissions and deemed to be in compliance with all applicable FCC (USA) and ICES (Canada) standards, as well. 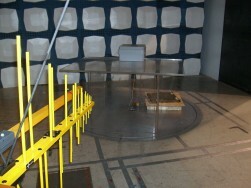 MET Laboratories, an OSHA-recognized NRTL (Nationally Recognized Testing Laboratory), performed rigorous analysis and testing of the EtherMeter at its main facility in Baltimore; and SCADAmetrics subsequently hosted a facility inspection, where its manufacturing processes were deemed to be in full conformance with NRTL-required quality control methods. Carrying NRTL recognition means that the EtherMeter meets Underwriters Laboratories’ strict standards for insulation system integrity and product safety. Local jurisdictional authorities, such as building, electrical and fire inspectors, may be reluctant to accept a product for installation within a facility unless it carries an OSHA-recognized certification, such as the MET Mark. Additionally, NRTL-recognition facilitates the inclusion of the EtherMeter as a component in UL 508A industrial control panels, such as those within pump stations, master meter stations, and treatment plants. All future EtherMeter shipments will carry the MET mark. EtherMeter™ Compatible With Metron-Farnier Water Meter Registers. SCADAmetrics recently completed compatibility testing of Metron-Farnier's new, 6-digit HawkeyeOER meter register; and the tests verified that its EtherMeter SCADA/Meter Gateway was able to successfully auto-detect and interrogate the register without exception. EtherMeter-compatibility means that totalization and flow-rate data from Metron-Farnier’s meters may now be interrogated, error-free, using the MODBUS protocol. Compatibility with SCADAmetrics’ Touch-Read Filter was also verified. As a consequence, the register may also be concurrently interrogated by an AMR touch-read system. The complete, up-to-date list of EtherMeter-compatible registers is maintained in the Compatibility Matrix at scadametrics.com. The test register was provided courtesy of Metron-Farnier (Boulder, CO, USA, 303-449-8833). 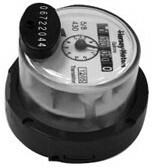 To learn more about Metron-Farnier's line of meters and the HawkeyeOER register, please visit metronfarnier.com. 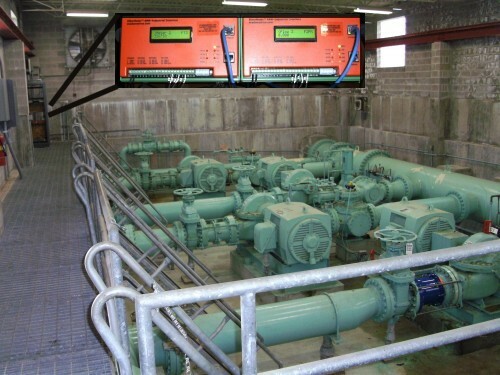 In a proof-of-concept project undertaken at a major metropolitan Water District, a pair of EtherMeters were staged within a 50MGD pump station for the purpose of eliminating SCADA totalization errors from a bank of four parallel Sensus 16 Inch Turbo Meters. Previously, the Turbo Meters had been outfitted with pulse-output registers, and approximate pulse-counting methods were used to collect totalization and flow rate data. In the upgrade, Water District engineering personnel performed a seamless integration of the EtherMeters into the SCADA system's Ethernet-based communication network. 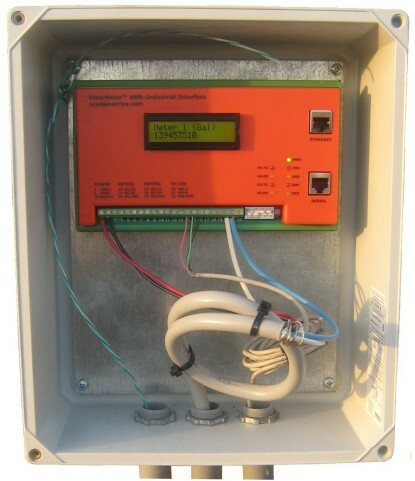 The Water District utilized Telnet and HyperTerminal for device setup, and the MODBUS®/TCP protocol for realtime collection of revenue-grade totalization and flow rate data. The Water District's overall SCADA system architecture is based upon Allen Bradley PLC's, the HMI software is Genesis, and the OPC server software is KepServerEx. Only minor modifications to the meters were required, as the legacy "High Speed Pickup" pulse registers on the Sensus Turbo Meters were upgraded to ICE® registers to provide error-free, encoded outputs. Photo of the 50MGD Pump Station. Four Sensus Turbo Meters (16 Inch), which were outfitted with ICE registers, are now monitored by two EtherMeters. The meters (not shown) are located in a below-grade vault several hundred feet from the pump station. The industrial communication protocol utilized in this application is MODBUS/TCP. At the new Gateway Water Treatment Plant and Distribution System in Sandoval (IL), EtherMeters were mated to each of the major meters within the Treatment Plant, Raw Intake Pumping Station, and Distribution Grid. 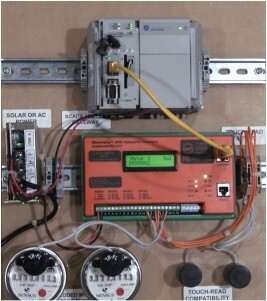 As a result, Gateway's SCADA System is able to interrogate each meter in realtime using the MODBUS protocol, and thereby provide operations personnel with a computerized display of each meter's exact totalization and flow. In this application, all meters were Sensus Turbines, Propellers, and Compounds outfitted with ICE® registers. Because each EtherMeter reads an encoded AMR signal from the meter, the totalizations displayed on the Plant's SCADA System are guaranteed to match those displayed on the registers. Gateway Water Treatment Plant (Sandoval, IL). 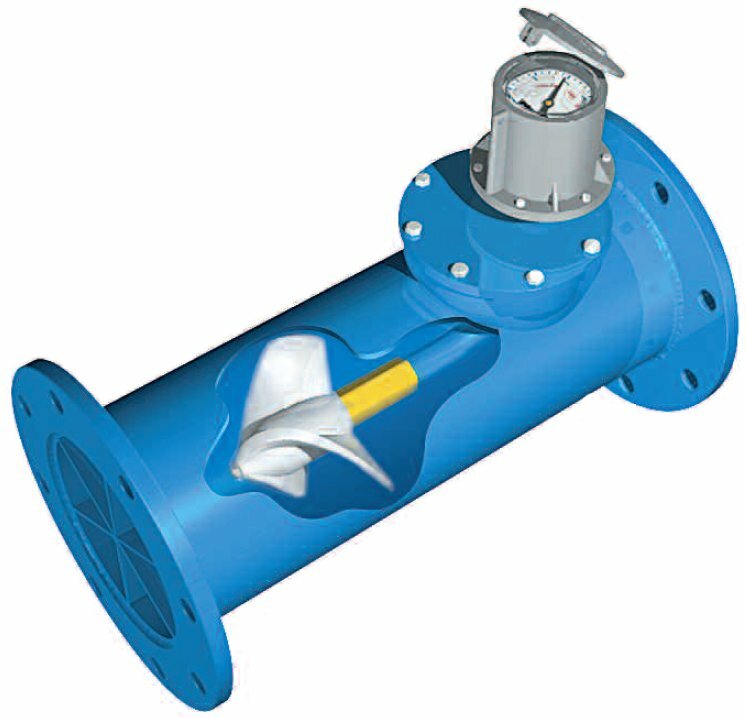 Raw Water Meter: 10 Inch Sensus Propeller Meter Outfitted With An ICE Register. via an RS-485 multi-drop MODBUS/RTU network. Compatibility testing of Hersey Meter's Translator encoder register was successfully completed at SCADAmetrics. Testing demonstrated that the EtherMeter was able to correctly auto-detect and interrogate the register without exception. Touch-Read Filter compatibility was also verified. The complete, up-to-date list of compatible registers is maintained in the EtherMeter Compatibility Matrix within the User Manual. The test register was provided courtesy of Hersey Meter (Cleveland, NC, USA). 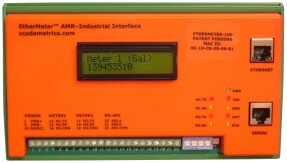 To learn more about Hersey meters and the Translator register, please visit www.muellersystems.com. A presentation and demonstration of the EtherMeter SCADA/Meter Gateway is scheduled for the Illinois Southern Illinois Water Operators Association. The meeting, which will take place at the Giant City State Park Lodge in Makanda, IL at 1:00pm, is open to interested visitors. A presentation and demonstration of the EtherMeter SCADA/Meter Gateway is scheduled for the Illinois Southwest Central Water Operators Association. The meeting, which will take place at the Knights of Columbus Hall in Jerseyville, IL at 6:00pm, is open to interested visitors. The EtherMeter Field Trials have recently included a successful focus on large Neptune Meters outfitted with their E-Coder and Pro-Read registers. 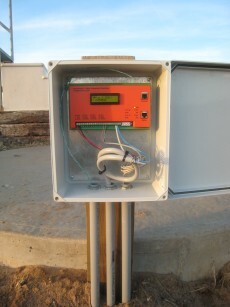 A photo of a working EtherMeter, communicating with a water plant master effluent meter (above). 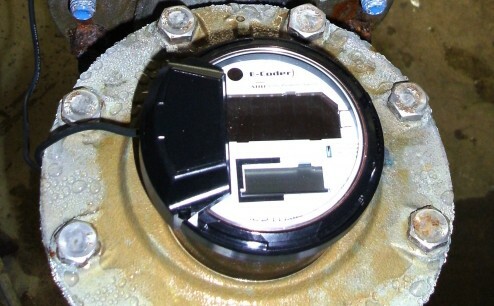 In this instance, the monitored meter is a Neptune 4 inch HP Turbine retrofitted with an E-Coder register. This EtherMeter continuously transmits the meter totalization and flow rate to the plant's master RTU using the MODBUS/RTU protocol; and power is delivered to the EtherMeter via an unused wire pair within the data cable. A closeup photo of the same enclosed EtherMeter is shown (above). 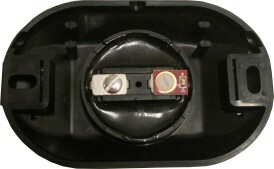 A closeup of the target Neptune E-Coder register (above). Like the Sensus ICE and Actaris CybleCoder, the Neptune E-Coder register transmits an exact totalization with 8 digit resolution (1 gallon increments for a 4 Inch HP Turbine). This particular installation resulted in the immediate detection of a leaking check valve (negative flows) within the plant. 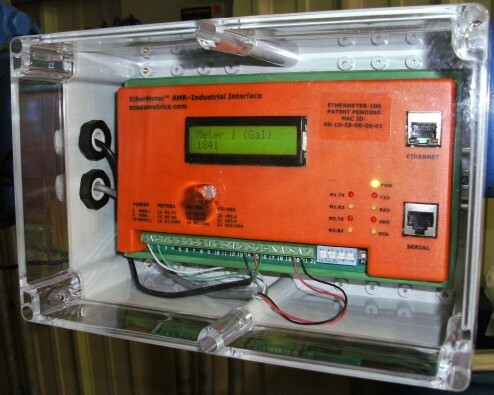 A presentation and demonstration of the EtherMeter SCADA/Meter Gateway is scheduled for the Illinois Rural Water Roundtable Meeting in Mount Vernon, IL. The meeting, which will take place at Ryan's Family Steakhouse at 11:30am-1:15pm, is open to interested visitors. The EtherMeter SCADA/Meter Gateway was unveiled at the Missouri Rural Water Association Technical Conference in Springfield, MO. Product literature and demonstrations were provided to the Engineers, Managers, and Operators in attendance. EtherMeter™ Field Trials Proceeding Smoothly. The EtherMeter Field Trials have validated the reliability and durability of the appliance, as it has been subjected to a rigorous battery of tests. A photo of a working EtherMeter, communicating with a Well Station master meter, is shown (upper left). A closeup photo of the same is also shown (upper right). In this instance, the monitored meter is a Sensus 6 inch Turbo with an ICE register (lower), installed in a below-grade concrete vault beneath the EtherMeter. The industrial protocol used here is MODBUS/RTU via RS-485. Note that in this application, the EtherMeter is communicating with  and deriving power from  a distant RTU via a buried RS-485/Devicenet cable.